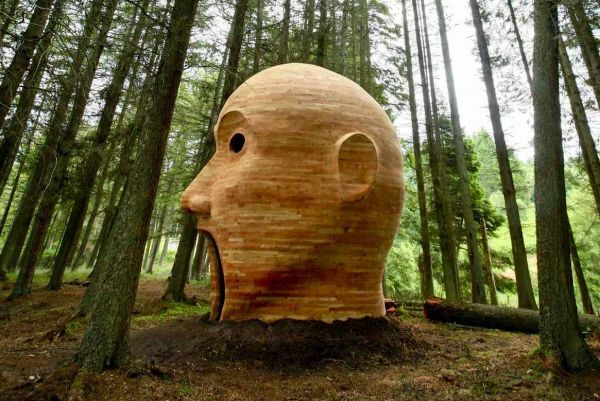 Curator Peter Sharpe talks to us about the Kielder Art & Architecture trail and how the landscape of Kielder Border Forest influences him, the artists and the sculptures. 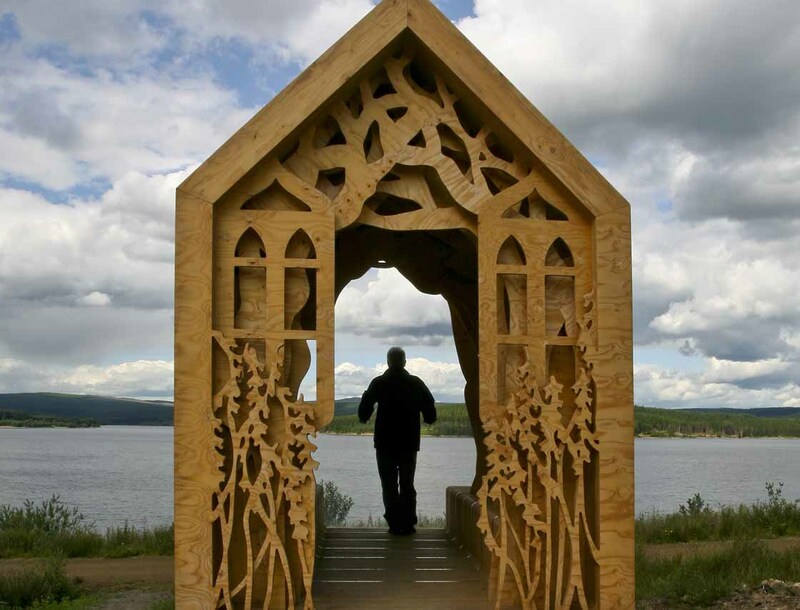 Working for Kielder Art & Architecture has provided me with the opportunity to learn about and experience the fascinating environment of Kielder Water & Forest Park. The sheer scale of the forest and lake allow for a huge range of creative responses that are able to co-exist without competing with the landscape and each other. They offer alternative insights into this landscape’s history, occupation, weather, seasonal conditions, flora and fauna. For me, the key attraction of Kielder has always been its sheer ruggedness. Not traditionally beautiful or scenic, I appreciate this landscape for its single-mindedness; for its strength and ability to generate abundant timber and water, but also for its man-made complexity. It has the ability to offer intimacy and beauty, the best of which can require some effort to find. In Kielder, the journey taken is an important and integral part of the experience. My first week working at Kielder saw me piloting a small boat across the lake to see how the construction of the Kielder Belvedere was progressing, a far cry from my previous job teaching in a Gateshead secondary school. I couldn’t quite believe my luck. The Belvedere went on to national acclaim and, as a project, neatly captured the crossover that Kielder Art & Architecture has often explored: sculpture as building or building as sculpture? Many of the works are essentially about framing and focusing our experience of the uniqueness of our environment, and helping to sensitise us to things that are always there, but that we often do not see. The Belvedere invites us to reflect on the linear form of this upland landscape with the distant dam. Wave Chamber captures the play of light on the water and presents it to us as a constantly changing movie within its dark interior. Skyspace isolates the sky in a way we never normally experience, a contemplative work that makes us think of light and how it might appear to us differently in Kielder compared to other places; and the Observatory directs our attention to the night skies whilst simultaneously opening our imaginations. If I am asked, “Which is your favourite artwork?”, I reply that when you are as closely involved as I am in the progression of new artworks, from the first idea right through to a completed structure, you experience each in a different way. Rather than having a favourite, I remember the ups and downs that make up each one’s story. I remember Nathan Coley’s dry sense of humour and our first attempt to transport his Italian Tower in flat-pack form across the lake strapped to a section of pontoon, which gently sank under the weight of too much material and had to be rescued. I remember Kisa Kawakami’s tree-born Mirage installation near Lewisburn self-destructing in high winds the day before the official opening, to be redesigned and reinstalled 6 months later. Not all memories are so catastrophic though. SIMPARCH, the American artists responsible for making Silvas Capitalis (the forest head), started the project trapped at Heathrow by immigration officials unconvinced by their reasons for wanting to enter the country, “We’re here to construct a giant head in the forest...” They turned out to be the most resourceful and engaging people I have ever had the pleasure to work with, just getting on with making the work in the forest despite the intensely cold February weather, eventually creating one of Kielder’s most memorable and popular artworks. I like the way that art changes depending on the individual. You always think about works that you are helping to create in a particular and personal way, but as soon as they open to the public, this will change. You discover that they no longer belong to you, but to everyone who thinks about them in their own very different ways. Art for me is about opening up opportunities for people to think for themselves. James Turrell said of the Kielder Skyspace, “It isn’t what I see that is important, but what you see.” He simply creates places within which help people create their own experiences. Against the backdrop of Kielder Water & Forest Park, that is what I aspire to do as well. To discover how the Northumberland landscape influences the Northumbrian personality with our 'It's in our nature' campaign.